Oslo, July 5th, 2017 – Acon Digital has released version 7 of their audio editor Acoustica. The entire application has been rewritten from scratch for cross-platform support and now runs on both Macintosh and Windows PCs. The new user interface comes with a modern dark theme and appears crystal sharp on retina style displays. Acoustica 7 is available in a Premium Edition and a feature limited Standard Edition. 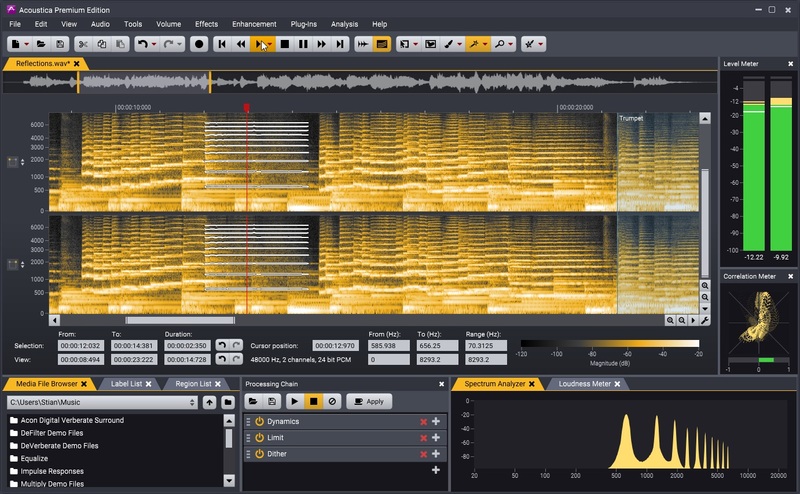 The Premium Edition supports multi-channel formats up to 7.1 surround and a new spectral editing mode allows precise audio restoration work since processing can be limited to isolated regions in time and frequency. Powerful restoration tools such as DeClick, DeClip, DeNoise and DeHum based on the award winning Acon Digital Restoration Suite are seamlessly integrated along with Acon Digital's plug-ins Equalize, Verberate and Multiply. Acoustica 7 is available in a Premium Edition ($199 USD) for advanced users and a feature limited Standard Edition ($59 USD) for beginners. Acoustica 6 users can upgrade for the price difference during a limited time period.